Abraham Maslow theorized that people have an inherent hierarchy of needs which must be met to fully develop. Just like the hierarchy of people’s needs, a website has basic and fundamental needs too. No, the image to the left is not the latest get-rich quick pyramid scheme. The pyramid to the left, shows the fundamental important needs at the base of the pyramid. Each higher tier represents needs that cannot be realized until all needs below are satisfied. Content is king. It is what people AND search engines are looking for in a website. By developing engaging and compelling content around relevant keywords for your site search engines will be able to accurately guide traffic to you. Behind the scenes, a website needs to be structured properly and optimized for search engines to be able to analyze the content of your site. Well structured web page code, page load time and special instructions for search engines (.htaccess and robots.txt files) must be used to tell them what content to index and crawl. A website should be designed to make it easy for visitors to find what they are looking for quickly and with ease. This will optimize the visitors experience on the site and help eliminate obstacles to conversion or confusing calls-to-action. The focus should be on delivering a preferred user experience that makes it easy for visitors to find what they are looking for. Inbound links are links into your website from other websites. These links are an essential part of the success of any SEO campaign because they are a highly valued factor of search engine ranking. There are many ways to increase inbound links, from link trading and paid placement to users sharing your content on social networking sites. 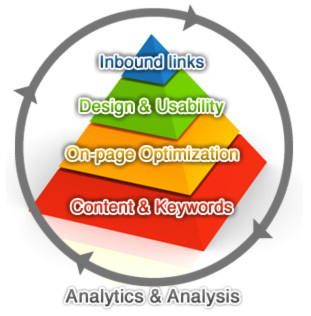 Web analytics and statistics are the foundation on which your online marketing campaign is built. Implementing analytics from the beginning of a project provides a baseline from which to measure the effects of your online marketing and SEO efforts. Joe’s early passion for art and music led him to study fine art at the Laguna College of Art & Design. With this background in art and design, he pursued work as a graphic designer. While working with website hosting companies and marketing firms in southern california, he gained invaluable technical knowledge and experience that would shape his career. Working within the challenging limitations of the early days of the web, Joe leveraged his problem solving skills to become the rare web developer who could bridge the gap between the disciplines of design and programming.